All transactions are safe and secure with a reliable history in online purchasing behind each of our associates. 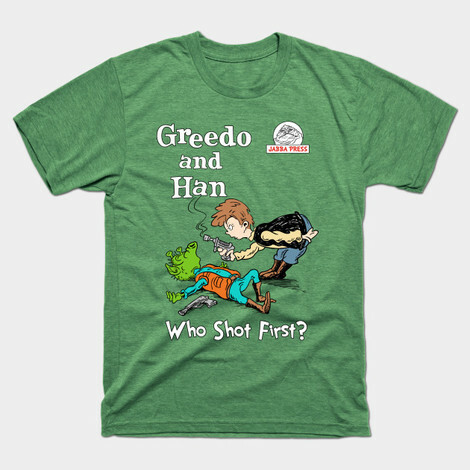 Buy the Greedo and Han t-shirt to own Dr. Seuss clothing and merchandise. If you like Star Wars and green eggs and ham, be sure to tell Sam I Am. If you are one to say, I would not eat them here or there, I would not eat them anywhere, then be ready to have Sam I Am come your way. He will try to convince you to eat them in a house or he will try to convince you to eat them with a mouse. If you are not ready for all that, then nab this Green Eggs and Ham t-shirt to wear under Dr. Seuss costumes. The design features a spoof on the title, incorporating Han Solo and Greedo. In addition to the Greedo and Han tee above, browse the Dr. Seuss Clothing Gallery for more apparel like men's and women's clothes, kids shirts or hoodies.